Former First Lady Rosalynn Carter, founder of the Rosalynn Carter Institute for Caregiving, says there are four kinds of people in the world: those who have been caregivers, those who are currently caregivers, those who will be caregivers, and those who will need caregivers. There should be a fifth on the list: Those who don’t realize they have begun the caregiver journey – and their ranks are growing daily. “They are helping Mom balance her checkbook, phoning Dad every morning to make sure he takes his cholesterol-lowering, diabetes, and arthritis medications, picking up groceries for a disabled neighbor – all sorts of things. They don’t self-identify as caregivers because they are ‘just’ being a good daughter or son or neighbor,” says, Amy Goyer, AARP’s caregiving expert and author of the recently published Juggling Work & Caregiving. Why is it important to “self-identify”? Because the earlier you realize you have begun the caregiver journey, the earlier you’ll understand the emotional weariness you may be experiencing – and start looking for ways to manage it. “Early on, symptoms of emotional fatigue tend to come and go; and they tend to overlap, too, so people need to identify them – right off the bat – so they can take care of their emotional health and other needs,” says Jo McCord, a senior caregiver consultant at San Francisco-based Family Caregiver Alliance (caregiver.org). If you have just begun the caregiver journey, and are experiencing the above symptoms, the following strategies will help you identify the new role you have taken on and help you manage the emotional stressors that can come early in the caregiver journey. Put a name on what you are doing. 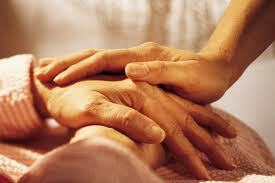 Caregiving isn’t just helping out, it’s taking on responsibility for the well-being of another person. “The quicker a person self-identifies as a caregiver, the quicker they’ll be able to recognize and deal with the emotional roller-coaster [symptoms] that can come as caregiver responsibilities increase,” says McCord. Listen to what your emotions are telling you. “Those feelings [see above] are normal responses to caregiving…Realizing that – that you are experiencing what everyone else is experiencing – will go a long way toward helping you take action for your own well-being and not react to them in a negative way,” says Jody Gastfriend, LICSW, the VP of Senior Care Services at Care.com, an online resource connecting families and caregivers. Embrace change. “Early on, people need to understand that the keys to being a successful caregiver are flexibility and adaptability on the journey,” says Goyer. Get help. A recent study published in the International Journal of Geriatric Psychiatry shows that, even at the earliest stages of caregiving, caregivers experience increased feelings of well-being when they seek help. To find those individualized options, tap into the wide array of home-based services and community programs and supports that are available, no matter where you live. Some are paid for on an hourly or daily basis; some are provided for a small or sliding fee; some are free. Perhaps the fastest way to find the ones you want, will use and can afford is to check with the HR department where you work. “More and more companies have recognized that their employees are also caregivers and use consultants to help them deal with caregiver issues,” says Gastfriend. But you can find a consultant on your own, too, by contacting local care managers, social service agencies, and/or national agencies, such as the National Association of Geriatric Care Managers. The caregiving expertise and knowledge of community resources these professionals can provide will help you prioritize your needs and help you locate the services, agencies and organizations that can provide the help you need to manage the emotional stress that comes with caregiving. “This can be an expensive option, but they’ll be doing a lot of the heavy lifting for you…and often you only need a couple of consulting sessions to get things moving in the right direction,” advises McCord. To find information on your own, start with your local Area Agency on Aging’s Family Caregiver Support Program and then widen your search net to include county or municipal offices on aging/disability, disease specific organizations (many publish excellent caregiver resource lists and guides), religiously-affiliated service groups, reputable caregiver Web sites and/or help lines, including those provided by Elder Locator (1-800-677-1116) and Family Caregiver Alliance (1-800-445-8106). Probably the most overlooked options for help, however, are support groups. “Connecting with others who ‘get’ what you are experiencing gives you a ‘safe’ place to talk about your feelings and hear about the options – the practical things, the strategies and tips – you can use to cope with your emotional stress. And they can help you deal with isolation, too,” says Goyer. Eileen Beal is a Cleveland, Ohio-based writer who has been writing about caregiver issues for more than a decade. This article was written with the support of a 2013 MetLife Foundation Journalists in Aging stipend administered through New America Media (newamericamedia.org) and the Gerontological Society of America (geron.org).